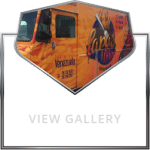 Find New and Used Vending Service Trucks for sale listed below in alphabetical order by company name. Please contact them directly for more information about their delivery trucks/vans/vehicles. Adrian Steel– Offers Commercial Van and Pickup equipment for sale. Walk in Van equipment, Cargo Trailer equipment. Located in Adrian, Michigan. Johnson Refrigerated Truck Bodies has been in business since 1932. Headquartered in Rice Lake, Wisconsin,Johnson is the pioneer and innovator of custom fiberglass refrigerated delivery equipment. A nationwide network of distributors and dealers provide sales, leasing and service for all Johnson truck bodies and trailers ranging from 6 to 36-ft. in length.